All the tips you need for a perfectly rich and creamy homemade caramel sauce. No thermometer needed. Have all of your ingredients measured, ready, and close to the pan so that they can be added immediately when it's time. Keep a constant eye on the stove. The temperature of the caramel will be very high, so keep your face and body away from the pan. In a medium heavy-bottomed saucepan (large enough to coat the surface with an even thin layer of sugar), heat water and sugar over medium heat. Make sure all of the sugar is evenly moistened from the water and there are no dry spots. It’s important to NOT stir the mixture, and instead gently swirl and shake the pan occasionally so the caramel will cook evenly and won't burn. The caramel will usually start to brown at the edges first. In that case, push the liquefied sugar towards the middle of the pan using a heatproof utensil such as a whisk, spatula, or wooden spoon. Once all the sugar has melted, pay careful attention and watch the pan, swirling it occasionally until the caramel turns a deep amber color. Add the butter very carefully, keeping your face away from the pan (mixture will bubble up! ), and whisk vigorously until butter has melted and fully combined. Remove from heat, then carefully add cream and keep whisking until combined. Add salt immediately after. Transfer carefully to a heatproof jar and let cool until warm before using. 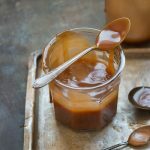 Caramel can be refrigerated for up to 2 weeks, or frozen for up to 2 months. Before using, warm it up for a few seconds in the microwave.